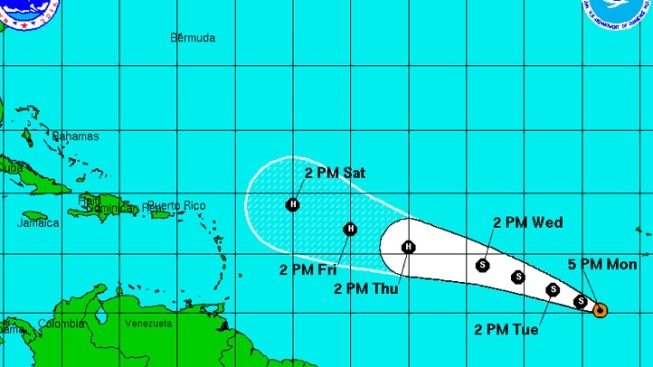 Tropical Depression 12 as of 5 p.m. Monday. A tropical depression that could become a tropical storm by Tuesday morning has formed in the Atlantic, the National Hurricane Center in Miami said. At 11 p.m. Monday, Tropical Depression 12 had maximum sustained winds of 35 mph as it moved west-northwest at 14 mph from a position about 460 miles southwest of the southernmost Cape Verde Islands. The depression was expected to strengthen and gain forward speed during the next 48 hours, possibly becoming a tropical storm as early as Tuesday morning. It is also expected to turn toward the west-northwest in the next couple of days. There were no coastal warnings or watches in effect early Monday. "On Saturday we'll have a better idea if there is even a potential threat to the United States," said Robbie Berg, an NHC hurricane specialist. "It's way way too soon to tell.. It's one of those things where we get a better feel as we go along."